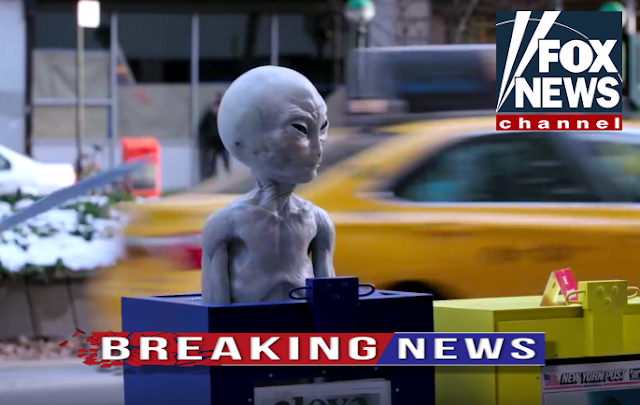 UFO SIGHTINGS DAILY: Alien Prank In New York City Startles People In Surprise Locations, Dec 2017, Video, UFO Sighting News. Alien Prank In New York City Startles People In Surprise Locations, Dec 2017, Video, UFO Sighting News. This funny video of aliens startling people is made to celebrate the coming of an all new ten episode series of the fabulous TV series THE X-FILES. The episode really makes you think. How would you react to an actual alien when you meet it for the first time, and how and where would that encounter take place? Well, a few aliens that look like us do intermingle with us, some to profit, some to help humanity advance in technology, but they look like us, so we would never notice them. However in this video, we get the chance to see what a surprise meeting might be like, in a moment when you least expect it. It funny, but the peoples reactions are real, simulating a real life scenario.